Ever notice how, as soon as you draw a line in the sand and decide to publish a list of resources, you immediately find more? That's what happened to me with my Activities for Children's Book Week, 2013 post. You might remember that it had lots of ideas to help you celebrate Book Week with your kids, and included links to a couple of resources I'd created, Free PDF, Activity booklet for Kids and Free PDF, Ideas for Children's Book Week Australia. Yet here I am today, bringing you even more resources I've found that I believe might be useful to librarians, teachers and parents who want to build learning activities around the theme for this year's Children's Book Week in Australia, Read Across the Universe. Only a couple of weeks until August 17! Nic Avery (aka @planningqueen ) has a post with Activities and Ideas for CBCA Short-listed Books. Thanks to Asha Rajan, I discovered some vintage printable sci-fi magazine covers and pages that are in public domain, according to Vintage Printable. (Their Information page sounds legitimate but as they say, there is no iron-clad guarantee that all images actually are public domain.) Be sure to check out the science pages to while you're there. The three images to the right in my collage above are from Vintage Printable. 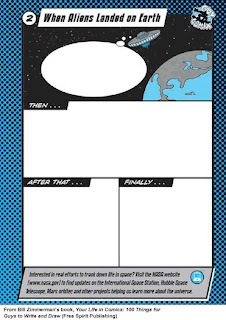 Kate, from Picklebums, has gorgeous space characters on a pdf for you to download. Megan Daley, from Children's Books Daily, has compiled a list of 20 Great Authors for an Author Study. This library guessing activity from Rachel Moani involves photographing a Cat in the Hat and asking kids to guess its location. I think it would be easy to adapt it to something like: Where in the school is the Reading Rocket? Make some kind of object like a rocket from recycled materials that suits the Universe theme and photograph it somewhere in the school. More instructions at Rachel's site. TL and Storyteller, Narelle Adams, has a lovely little song to teach your kids for Children's Book Week 2013. It's embedded below. 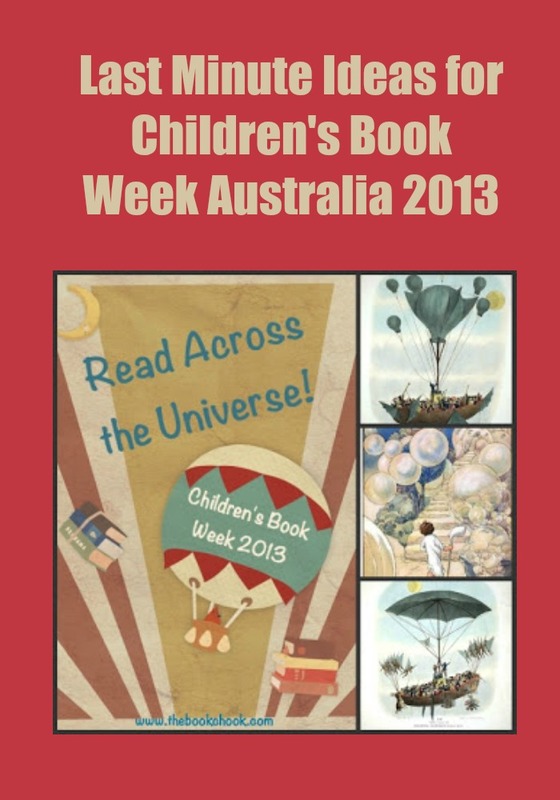 Narelle also has an excellent pinterest board with lots of ideas for Children's Book Week 2013. TL Kerry Gittins created song lyrics called One Book to go with a Blondie tune. Kids are going to enjoy this catchy song that fits the Universe theme! Find it on Kerry's Book Week wiki, and embedded below. I know I've mentioned Mrs Mac's Library previously, but it's been updated recently with lots of activities and links allied with the short-listed books. Be sure to check it out. TL Petra Pollum has a great ScoopIt board where she's been curating links and ideas to use for Book Week activities. Did you know you can get dry erase contact paper? I didn't. 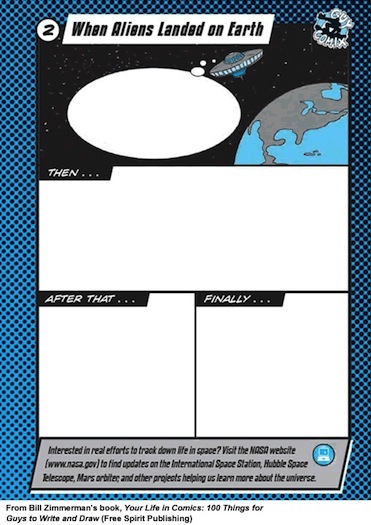 Here's a tutorial about using it to make speech bubble signs for a photo booth. I love the idea of kids coming up with something to say that is uniquely them, and you could maybe get a volunteer/parent to supervise/erase/take photos. I saw call-outs used recently at a library blog, where the books were making comments about themselves. Another simple idea that apparently resulted in books zooming forth from the library! Here's a lovely poem from Amy Ludwig Vanderwater about the joy of borrowing a library book. Perfect for a library display or just to share. I emailed Amy and she says poems are free to share for "educational, non-profit purposes." Hers is a great website for poetry resources. I keep bumping up against wonderful ideas for library displays. Even though I don't have a library --just bulging bookcases-- I've stopped fighting my obsession and started a Pinterest board so I can at least Pin the ideas I love. If you don't check out any other of my pins, be sure to visit Rachel Moani's website - fantastic ideas. One of many educational and attractive display ideas I saw with a Space theme was here. Scroll down to the second one, Reading is Out of This World Paper Plate Craft and Reading Activity. Because they saw my CBW post at The Book Chook, the people from Green Ant contacted me to tell me about their cardboard rocket ship cubby house. It's 119cm high, has an opening door and viewing window, kids can decorate it and is $39.99. If you need something fast, or your Principal is begging you to spend more money, it might work for a last minute idea for your library or a display space. Delivery details: seem to be $10 via Aust Post, plus a small bulky goods surcharge depending where you live. Speaking of display spaces, I found these online: awesome orbs. They look/sound good - flashing lights inside a sphere, tiny batteries included. Two are $4.95, pack of 20 = $39.95. You can wear them as earrings, suspend them in a room, even float them in bowl of water. Dressing up for Children's Book Week? Here's a tutorial for making your own steam punk goggles at Geek Mom. You would need time to make them but they are very cool and if you click through to the end, she has them worn ON a hat. If you missed my post about Literacy-Based and Other Guessing Games, you can find it here. And finally, something that has nothing to do with books or universes, but is nevertheless very cool. Maybe your kids might like to emulate this synchronised clapping? Great challenge to get them moving! If you've enjoyed this post, or any others at The Book Chook, I'd love you to help me spread my literacy, learning and literature ideas by promoting via Twitter, Pinterest, Facebook, StumbleUpon, G+ or any other way you decide. Thank you so much we are all inspried her in a small school in South Australia. Love Book Week - there is so much to do. Just bought the Green ant toys rocket ship. Note to all the young players - it's blak and white. So close now Jodie - I swear I can feel the excitement building! Just wanted to say thanks for mentioning our Awesome Orbs in this post. Glad you liked them. I love to think of them twinkling away in countless schools across Australia, Peter! Hmmm, yes it does. I will investigate. Stand by. Peter, it seems Kontactr has disappeared. At least I can't find it online any more. If you will leave me your email in a comment, I won't publish that comment, but will contact you.